Almost a Week ago even befor (Build 640) was made public, we tested Build 640 befor wanting to release it, But t kept showing the upgrade message and wouldnt let us use it. This version has been Updated at least 2-3 times and now finally we are allowed to login and use it without getting the Upgrade Message. Last week Someone posted that Build 640 would be different than the other Builds. Currently we dont see any difference between the older builds or the new Build 640! If you guys notice anything new or any other Changes in the new Build 640, then Feel free to post it below. Thank you! 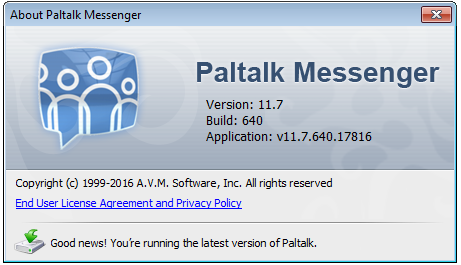 Paltalk released their First Mac Version, including a new Windows Desktop Version which looks really nice. The Windows Desktop Version was removed again and currently it doesnt allow logins for more than a few seconds. But then logs off again..